The map here below shows changes in the under 18s population of each electoral ward in London from 2008 to 2012 and from 2010 to 2012. In the areas covered by the Charity there has generally been a rise in the number of children. In all the boroughs, there is at least one ward where the under 18 population has risen by over 8%, with a notable cluster around Camden, the western part of Westminster and Brent. However, in parts of Hammersmith & Fulham and Kensington & Chelsea the number of children has fallen. The map is interactive, you can zoom in and look at local areas, see the associated values and look at how the pattern has changed in the two time periods of 2008 to 2012 and from 2010 to 2012. 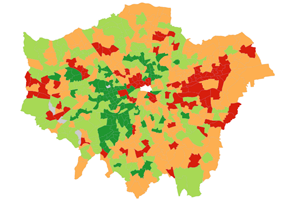 This map shows the distribution of the largest ethnic groups at ward level throughout London. The proportion of the population who are white but not white British has increased almost everywhere. Ealing in particular has seen large rises. The overall pattern, if not the numbers, is quite similar to a decade ago – the areas towards the centre have higher proportions of white non British, with those at the edges having lower proportions. The interactive map allows for the same comparisons over time for Indian, Pakistani, Bangladeshi, Black African and Black Caribbean populations. The patterns are all very different, with those ethnic groups being much more clustered than the rather diffuse white non British category.